Did you know that according to the National Cancer Institute, 12.4% of women will be diagnosed with breast cancer at some point in their life? 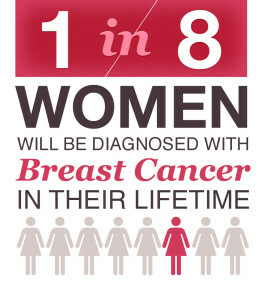 The odds that you or someone you know could develop breast cancer is 1 out of every 8 women! However, with the advances in technology, the amount of women surviving breast cancer has increased dramatically. Of the women with breast cancer that is localized, confined to the primary site, the chance of survival is 62%. Of the 62% of those survivors, 98.9% survive 5 years or more after initial diagnosis. That’s over 20% more than the 5 year survival rate from 1975. What does this all mean for you? With the survival rates rising, the need for treatment grows. The cost for treatment, however, has also increased. The average cost to study the cells in order to identify the type of breast cancer can range anywhere from $500 to $5,000. Once the testing is done and the breast cancer type known, treating the disease can begin. In a study by American Health & Drug Benefits, the average cost of stage 1 breast cancer treatment between 2009-2012 was $82,121. When it comes to your loved ones, no cost can stop you from getting the care they need, but the financial strain that accompanies treating breast cancer can be monumental. Despite what it may seem, there is a way you can afford treatment without debt. Back in 1983, a doctor named Marius Barnard had witness too many of his patients suffer from financial debt after their procedures. Dr. Barnard worked to bring forth a new type of insurance that would help those in need, calling it critical illness insurance. Having a CI plan means that, upon diagnosis of any invasive type of cancer like breast, the insured will receive a cash benefit to help cover their medical expenses. A CI plan can cost as little as a $1 a day so you can feel safe knowing that you will be financially secure if you’re ever diagnosed with a critical illness. Breast Cancer can be treated, and surviving it shouldn’t lead to a life a debt. For more information on breast cancer, please visit cancer.gov. For information on critical illness insurance you can visit our CI product page, or call AC Financial Group to speak to a licensed insurance advisor.